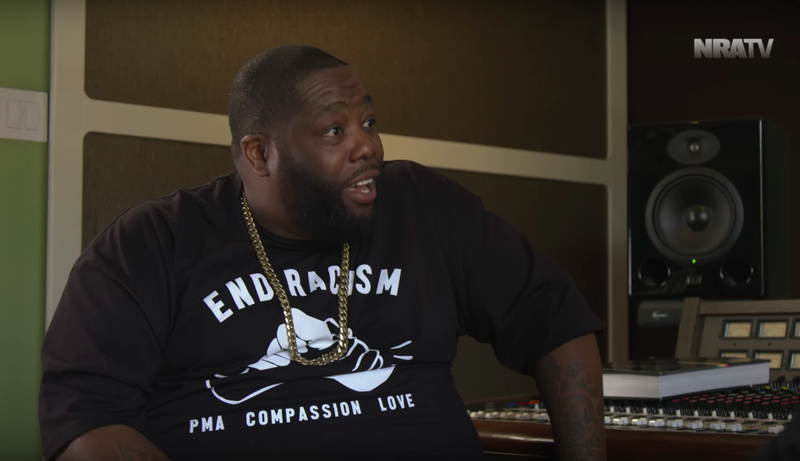 Hip-hop artist and Bernie Sanders supporter Killer Mike appeared in an NRATV video Saturday to speak out in support of gun ownership and expressing some very curious arguments to boot. Sitting with NRA member and host Colion Noir, Killer Mike listened to the host express how he has empathy for children who are shot and killed in school shootings—even though Noir thoroughly mocked the Parkland, Fla., shooting survivors and their planned March for Our Lives as a “carnival” in a previous video. The guns part is simply not true. Okoye grumbled, “Guns, so primitive” in Black Panther, the movie Killer Mike referenced. This statement is troubling because it ignores the real issues behind bullying and the psychological trauma it produces. The Root has reported on the intersections of bullying and suicide, for example. Listen, Killer Mike can believe what he wants about gun rights and be friends with whomever he chooses, but the problem most folks have is his appearance on an NRA-funded platform. In case you didn’t know, the NRA cares nothing about black people. Killer Mike mentioned Jordan Davis without, at least in the video, explicitly calling out the NRA for not supporting his mother. Same with Philando Castile and other black people shot and killed by cops.